A great price on very reliable 380 ACP ammunition in a massive case lot for those hard to feed .380 Autos. 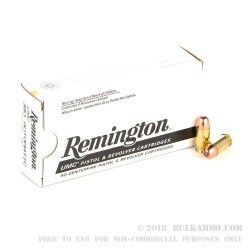 This is the Remington UMC 95 grain FMJ load for the .380 ACP in a 1000 round case lot which is packaged as 4 boxes of 250 rounds each. The round is very well known as one of very few that can reliably feed and extract in most mainstream small semi auto handguns chambered in the often challenging .380 ACP cartridge. Yes, it’s true, no .380 factory load is immune to ALL of the feeding concerns that come with .380’s but the Remington UMC has done a very good job across a very wide spectrum of firearms. The brass case and Boxer primer make it an easily reloadable cartridge and the full metal jacket 95 grain projectile makes it an easy to feed round. Combined with the stout powder charge and the top quality brass, most guns can easily be broken in on this ammunition. That’s one of the primary purposes for this ammunition – breaking in a gun on the range or just general range work. The relatively inexpensive cost compared to some .380 Auto ammunition makes it a first choice for those who just want to shoot. Q: I'm a relatively new gun owner. What are the differences between the UMC 95 gr. and the LVE which is 92 gr. but considerably more expensive? A: The biggest difference is that the LVE uses a steel case, which is not reloadable, while the UMC uses a brass cases, which can be reloaded. 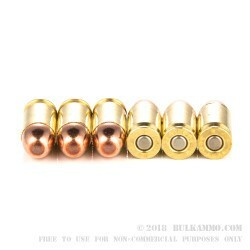 However, the bulk price for LVE is based on a quantity of 1680 rounds, not 1000, and the per unit cost is lower than UMC. 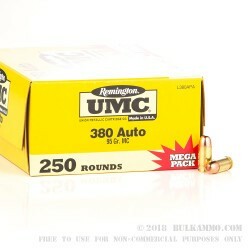 Q: Is this the least expensive .280 ammo you carry? 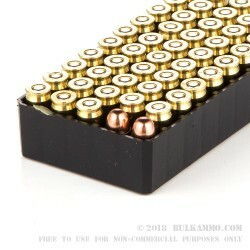 A: The least expensive brass cased .380 ammo we carry is S&B.